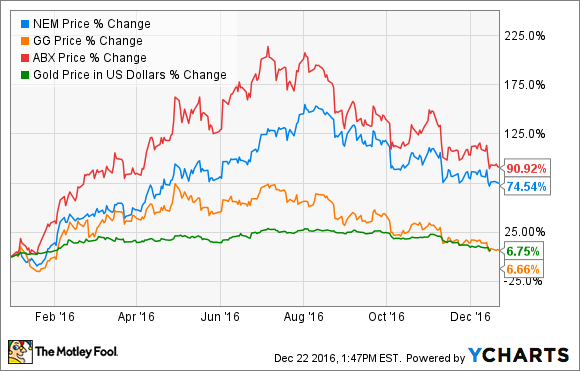 Is Goldcorp Inc. Really a Better Buy Than Barrick Gold Corporation? Digging into why an analyst recently upgraded Goldcorp while downgrading Barrick Gold. An analyst at TD Securities recently upgraded Goldcorp's (NYSE:GG) stock from hold to a buy while at the same time downgrading shares of Barrick Gold (NYSE:GOLD) from buy to hold. Driving that swap is a view that there's nothing left to excite investors at Barrick Gold because it has mostly completed its turnaround. Meanwhile, Goldcorp has the potential draw attention should it release a compelling plan at its investor day in January. While that thesis makes sense, investors should not rush out to swap Barrick Gold for Goldcorp. Here's why. Meanwhile, driving Goldcorp's underperformance is investor frustration due to a lackluster operational turnaround, which has taken much longer than expected. However, TD believes that Goldcorp intends to address this underperformance at its investor day next year. In fact, it predicts that the company will unveil a new three- to five-year production plan and provide an update on its $250 million cost-reduction initiative. These updates could reinvigorate investors, which might shine a light on the stagnant stock. TD is not alone in this bullish view. An analyst at Desjardins Capital Markets recently selected Goldcorp as its top pick, believing that the gold miner will show an encouraging production trend when it provides multiyear guidance next year. The Desjardins analyst expects the company to announce excellent progress on its $250 million cost-savings initiative as well. Meanwhile, the TD analyst believes that Barrick Gold does not have much more upside because its catalysts have already played out. After all, it's finished most of its debt reduction and operational overhaul, which better positions the company to weather lower gold prices. The TD analyst also has concerns about the company's declining production profile, which could fall 23% by 2021, the weakest outlook among senior North American gold producers. That lack of clear upside catalysts leads TD to believe that Barrick Gold's stock could meander along for quite some time. There's no doubt about it: Barrick Gold has undergone a dramatic transformation over the past few years. It cut debt from more than $13 billion at the end of 2014 to below $8 billion. In addition, the company plans to get debt below $5 billion in the near term, while aiming to be debt-free within a decade. It intends to take several steps to achieve that goal, including potentially monetizing its Australian superpit joint venture, which it co-owns with Newmont Mining, and generating excess cash flow for debt reduction. That said, Barrick Gold's primary aim is not to be debt-free but to become a free cash flow machine. That means generating a growing stream of free cash flow in any gold price environment by owning the best-run and lowest-cost gold mines in the world. Given that Barrick Gold still has much work to do to achieve its ambitious transformation, there still appears to be upside catalysts on the horizon. It is also worth noting that despite the run-up this year, Barrick Gold's stock is still ridiculously cheap, even compared to Goldcorp. That relative valuation gap suggests that Barrick Gold's stock could still have room to run, especially when investors embrace its strategy to grow value over increasing production. It is likely that Goldcorp will have good things to say at its investor day next year, which could lead to some enthusiastic buying. However, the company has had trouble meeting expectations in the past, meaning that there are no guarantees it will meet them in the future. Furthermore, there still appears to be more upside at Barrick Gold, especially if gold prices stop their slide. Not only could the company announce additional value-unlocking asset sales, but its management team has an ambitious plan to transform the leading gold miner into a premier value creator. As that strategy starts bearing fruit, it could be the catalyst that sends the stock out of the bargain bin.